Contrary to popular belief, the best way to use wood is not simply to leave the vast majority of it alone. Recent findings suggest that the ideal course is more active: harvesting a much higher percentage of new growth either for raw building materials or for burning as a source of fuel. In a paper co-authored with Yale graduate student Nedal Nassar and faculty from the University of Washington, Professor Chadwick Oliver of the School of Forestry and Environmental Studies analyzed how much CO2 and fossil fuel savings would be yielded by using solid wood products, burning wood for energy, and harvesting forests sustainably. The Stadhaus Murray Grove Tower in London, a residential complex completed in early 2009, is built entirely out of timber — even its load-bearing structures and stair cores. At nine stories, it is currently the tallest building of its kind in the world. Photo Credit: Bing Maps. The use of wood in new construction prevents decomposition and therefore sequesters the carbon stored during photosynthesis, a process termed the storage pathway. However, wood-based construction also presents an alternative to more energy-intensive processes, such as the production of steel, concrete, or aluminum. This trade-off is known as the avoidance pathway. “Some people only calculate the amount of carbon that’s in the wood, but the real savings is by not having to burn all of that fossil fuel,” he said. According to recent research compiled by Oliver, the production of steel, concrete, brick, and aluminum represented 17 percent of global fossil fuel usage in 2010, not including transportation and on-site assembly. Replacing the common steel and concrete building materials with wooden counterparts can save on average almost four kilograms of CO2 per kilogram of wood. 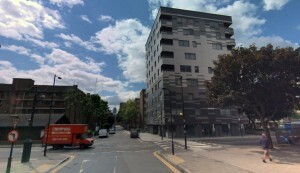 One mid-rise apartment building in London, completed in 2009, was built using only cross-laminated timber (CLT). CLT is engineered from layered panels and is similar, in terms of carbon savings, to solid wood products. For this project, experts estimate that they saved 310 tons of carbon and 23 weeks of labor compared to using conventional reinforced concrete. While the better parts of harvested wood, like these, are used in construction, scrap materials can be burned for energy. Photo Credit: Tony Hisgett/Flickr Creative Commons. However, misconceptions about wood, especially as a primary load-bearing structure, abound. Associating wood with risk of fire is common, but dense, solid wood is surprisingly flame-resistant. When a beam is thick enough, fire will char the outside, case-hardening it and preventing further damage to the core. In fact, a wood beam can retain structural integrity at temperatures capable of melting steel. When properly treated, wood buildings can have a lifespan comparable to those made from other materials, although buildings in the tropics need to have their first stories made from concrete to prevent rot and termites. “The issue that it is a short-term product or a dangerous product […] is a myth,” said Oliver. Burning wood as an alternative to fossil fuels saves only slightly less energy than the combined avoidance and storage pathways of using wood as a construction material. It is useful in conjunction with the first strategy because parts of trees that are unsuitable for building can be burned, keeping them from rotting and releasing both CO2 and potential energy. With the increase in wood harvesting proposed by Oliver and his co-authors, the use of scrap wood and un-merchantable logs would raise the total global fossil fuel savings from 10 percent (with construction only) to between 12 percent and 15 percent. 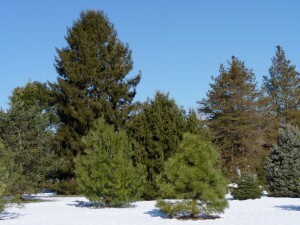 At least for the time being, most wood harvested for construction is taken from a few different types of conifers, which are typically found in areas of temperate climate like the United States, Canada, northern Europe, and Siberia. Photo Credit: John B./Flickr Creative Commons. Removing wood becomes even more beneficial where there is a significant acreage lost to wildfires. “If you have an overly thick forest over a large area, it is highly susceptible to one big catastrophic fire,” Oliver explained. Naturally occurring variations in a forest’s age and density, called a mosaic, make forests less vulnerable to a single massive fire. A renewed interest in sustainable tree harvesting would work to preserve this mosaic, whose patchwork of dense and sparse growth also encourages animal biodiversity. This active management could restore the mosaic in places compromised by cropland development and other human activity. 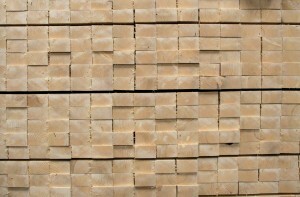 A cut through several layers of cross-laminated timber. Photo Credit: Alex Schreyer/Flickr Creative Commons. Around twenty percent of wood growth — the amount of new growth that occurs on top of existing mass — is currently being harvested globally. In the U.S., this number is higher, with around half of new growth being felled. About 41 percent of the current harvest comes from planted forests. With a dramatic increase in the amount of wood sustainably harvested, up to 31 percent of CO2 emissions and 19 percent of fossil fuel consumption could be avoided, an undertaking producing benefits across a number of spheres. Oliver thinks that the focus in construction should be on mid-rise buildings and infrastructure: “If we build it out of wood, we can have both better forests in terms of biodiversity […] and save a lot of CO2 and a lot of fossil fuel.” In other words, as scientists and environmentalists study ways to reduce detrimental emissions, consuming more wood may be one of the best ways of producing less. Cover Image: Although cross-laminated timber (CLT) has not been specifically studied for comparable efficiency, it is thought to have properties similar to solid wood products. CLT is useful for constructing taller structures. Photo Credit: Denna Jones/Flickr Creative Commons.